MASIGATI, HERBERT G. & CHILONGA, KONDO S.
Inadequately controlled postoperative pain (POP) subjects individuals to complications which may be fatal or leading to prolonged hospital stay. Complications from inadequately controlled POP may alleviate the existing shortage of hospital human resource for health in health facilities in developing countries. The burden and challenges of POP management at health facilities in Tanzania is not known. This study was therefore carried out to evaluate postoperative pain management and patient satisfaction with care given at Kilimanjaro Christian Medical Centre (KCMC). 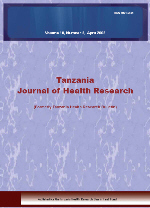 This descriptive prospective hospital based study, was conducted at the Kilimanjaro Christian Medical Centre in Moshi, Tanzania from August 2011 to March 2012. POP and patients' satisfaction with pain relief scores were assessed using pain and satisfaction numerical rating scales. Pain assessment was done at 24 hours and 48 hours after operation. Satisfaction was assessed on 48 hours post surgery. All adult patient aged 18 years and above whom were operated in general surgery ward, KCMC and accepted by signing consent were involved in the study. Patients suffering from nervous system were excluded from the study. A total number of 124 patients were recruited and participated in the study. Sixty-five (52.4%) were males and 59 (47.6%) females. Mean age (SD) years 40.9 ± 15.4. The largest percentage of individuals had mild pain both at rest (45.2%) and during movement (44.4%). Patients whose analgesia was administered intravenously were more likely to be satisfied with POP management than those given intramuscular analgesics (P= 0.028). Analgesia used in combination increased significantly the proportion of pain free individuals 48 hours postoperative compared to 24 hours postoperative (P= 0.003). In conclusion, the postoperative pain management is still a challenge in our centre as nearly half of the patient had mild pain in the first 48 hours post surgery.